Results: A new technique from Pacific Northwest National Laboratory and FEI Company lets scientists efficiently resolve elements' locations in three dimensions. The team's technique combines scanning transmission electron microscopy and X-ray energy dispersive spectrometry with a new detector arrangement and a brighter electron beam. The result is a three-dimensional map of the elements' placement on a sample smaller than a single blood cell. The team applied this technique to a lithium-rich nickel-based material that could be part of tomorrow's batteries. 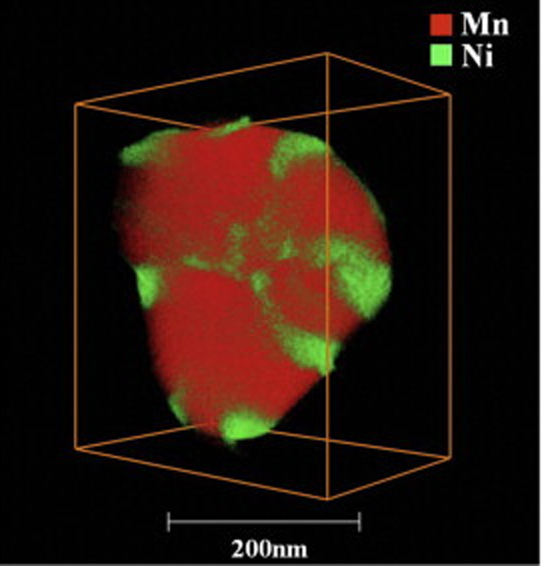 They discovered how nickel was segregating away from other elements on the material's surface. "This technique gave us our fastest, cleanest view yet," said Dr. Chongmin Wang, a materials scientist with the national laboratory's Chemical Imaging Initiative. "The paper is proving popular; it is Ultramicroscopy's most downloaded article in the last 90 days." Why It Matters: Scientists, along with the rest of the population, want answers quickly and accurately so they can focus on what matters most. The team's technique provides precise 3D chemical images in hours, not days, and avoids the time and expense of reshaping samples and transporting them to other instruments. The information generated by this technique could help in the intentional, versus trial and error, material design of longer lasting, higher capacity batteries. Methods: The team's method combines high-angle annular dark-field scanning transmission electron microscopy with X-ray energy dispersive spectrometry. The microscopy provides detailed information on complex architectures, while the spectrometry provides the elemental distribution. For the spectrometry, the team arranged four windowless silicon drift detectors around the sample. The detectors, with improved tilt response, quickly scanned the sample. Because the electron beam did not stay on a single spot for more than 25 microseconds, the scientists avoided "parking" issues, where the electron beam lingers in a single spot and damages the sample. The scans from the four detectors were combined and joined with the microscopy information using specialized software. This technique is faster and provides a wider field of view than more traditional 3D techniques such as scanning electron microscopy combined with electron energy-loss spectrometry or atom probe tomography. In 3 hours, the team obtained data sets from 29 microscopy images and elemental maps. Other techniques can take up to a day and do not provide as clear an image. Further, this single instrument provides a wider field than similar chemical techniques and allows scientists to see individual particles without additional preparation that could modify the native structure. "It is now possible to obtain 3D composition maps from nanoparticles in their native state and reduce the total time to reconstruct chemical information," said Dr. Libor Kovarik, a PNNL scientist on the team. What's Next? The team continues to investigate how elements aggregate and drift in lithium-ion batteries and other energy storage materials. In addition, they are refining their chemical imaging techniques, striving to provide better ways to gather detailed information.